When I first started researching the licensing industry over 15 years ago, each manufacturer used many art styles. But now that has changed and manufacturers have different art needs. Even though some of the manufacturers in different product industries still use a variety of art styles on their products, many have shifted to only one or two. Thus, there are not as many opportunities for artists to license their art unless they use multiple styles. 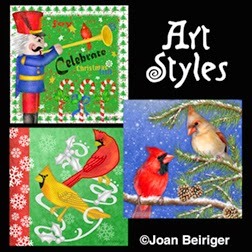 For instance, it is harder to license realistic styled art to greeting cards manufacturers because many now use more graphic and whimsical art styles. This article discusses the three art styles seen most often on products (whimsical, graphic and realistic). To avoid confusion, below are the definitions and links to images of realistic, whimsical and graphic art. Note: All three of these styles have a large range of looks but they still fall into these categories because of their general characteristics. Realism is a visual art style that accurately depicts what the artist sees. The images are accurate, detailed, and not embellished. This art style ranges from a painterly look to almost photographic in appearance. To see some examples, view "Artists Directory of Realistic Painters". A whimsical art style is often described as colorful, fanciful, playful and also as mischievous, quaint and eccentric. Images can range from a simplistic childish look to a sophisticated intricate look. See examples of whimsical art at "Favorite Whimsical Artists" and "The Whimsical (Decorative Art)". A graphic art style is the depiction of things seen by an artist using an illustrative representation with a drawing, sketch or painting. Often artists create this style on a computer with Adobe Illustrator application. See "9 Inspiring Graphic Designers and their Distinct Design Styles" for examples of this art style. In the past, manufacturers used numerous art styles on their products. Therefore, artists were successful in licensing one image to many industries. Now it is more difficult to get multiple licensing deals for one image because each product industry and even manufacturers in the same industry have their own specifications on what they want. And, the specifications are not uniform from industry to industry or manufacturer to manufacturer. Below are some of the industries and a "generalization" of the art styles now used on their products. The greeting card industry is one of the most changed industry that licenses art. To compete with e-stores, manufacturers that sell to retail stores have increased the embellishing of their products with ribbons, glitter, jewels, metallic, laser cut designs, etc. Many manufacturers use a graphic style art since embellishments can be easily used on them. Also, the graphic art style appeals to the esthetics of many consumers that feel that simplicity of graphic art is sophisticated and for those who believe in the maxim that "less is more". Those that walk the National Stationery Show or look at greeting card websites listed on artist Kate Harper's blog will discover that the majority of manufacturers use graphical, whimsical, and cartoons styles on their cards. Although some of the larger card manufacturers having numerous card lines do license some realistic art styles. Also, card manufacturers that cater to niche markets (museums, historical monuments and parks, catalogs, specialty gift stores) tend to license more realistic art than other styles. The decorative flag industry is also moving away from using realistic art. Flags are now mostly colorful whimsical styles with a central image that stands out. Look at the decorative flag e-stores on the Internet such as "Just For Fun Flags" to see examples of the licensed art styles. Although some manufacturers use realistic and whimsical art for their gift bags and wraps, graphical styled art is now more prevalent in large chain stores including dollar stores. See examples of Target and Walmart gift bags on their websites. Depending on the manufacturer, all three art styles are used on fabrics for the quilting and craft industries. Look at the website of Robert Kaufman Fabrics to see the selection of themes and types of art styles they license. Below are some facts that artists should be aware of when submitting art to manufacturers. These are my opinions and of course others may have different opinions. 1. In the past, artists could submit art to almost any manufacturer in any industry and her/his style would fit the needs of the manufacturer. NOT ANY MORE. Now to make sure their art fit the needs of the manufacturer, artists need to research every manufacturer they plan to submit art to. 2. Fewer manufacturers are licensing realistic styled art than in the past. 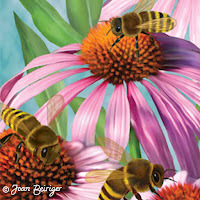 Artists that create realistic art will have a harder time finding manufacturers that are willing to license their art. 3. Now, whimsical styled art seems to be the most popular style for most industries. Artists that create whimsical art have the best chance in finding manufacturers that will license their work. 4. Graphic style art is prolific in the greeting card and gift bag industries. Artists that use this style will have any easier time licensing their art to manufacturers in these industries than those artists that have a realistic or whimsical art style.